3-point Hitch with Telescopic Lower Links Standard - category 1 with a hitch lift capacity up 1808 for XR3037 models lbs. allows easier attachment of a wide variety of implements. Drawbar Standard – increases the usefulness of the tractor without the additional optional cost. Extendable lower links-makes connecting implements easier. Comfortable Cab (Cab Models) - offers roomy, unobstructed view in AC/heated comfort and includes interior lighting, front wiper/washer and side mounted mirrors. 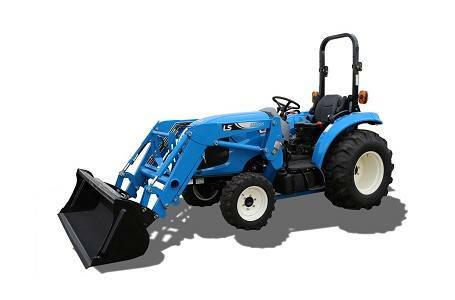 Optional Quick Attach, Skid Steer Compatible Front End Loader - remove or attach in moments. With 2182 lbs. of lift capacity for XR3037, it outperforms others in its class. Grill guard comes standard with loader rather than an option like others in its class. Overall length with 3pt: 121"
Height to top of Cab with Ag tires: 87"